Crankshaft pulley installer – Jaguar No.303-102/335/2. Crankshaft pulley puller – Jaguar No.303-D121. Crankshaft vibration damper holder/wrench strap – Jaguar No.303-D055. 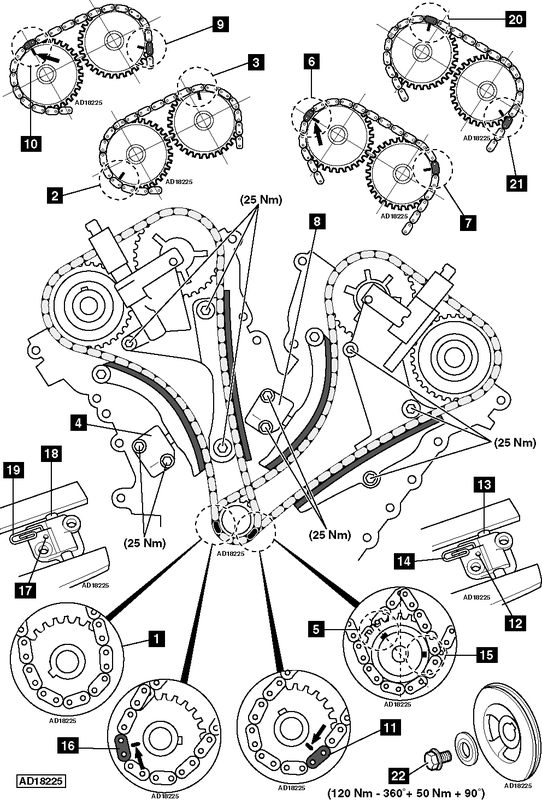 Ensure crankshaft sprocket keyway at 7 o’clock position  . Ensure timing mark on RH inlet camshaft sprocket at 1 o’clock  . Ensure timing mark on RH exhaust camshaft sprocket at 8 o’clock  . RH chain tensioner  , RH tensioner rail, RH chain guide and RH chain. Turn crankshaft clockwise until crankshaft keyway at 11 o’clock position  . Ensure timing mark on LH inlet camshaft sprocket at 9 o’clock  . Ensure timing mark on LH exhaust camshaft sprocket at 2 o’clock  . NOTE: Coloured links may not be aligned. LH chain tensioner  , LH tensioner rail, LH chain guide and LH chain. Remove bearing caps of each RH camshaft. Rotate RH inlet camshaft until timing mark at 5 o’clock position  . Rotate RH exhaust camshaft until timing mark at 12 o’clock position  . Tighten bearing caps of each RH camshaft. Ensure crankshaft sprocket keyway at 11 o’clock position  . Fit crankshaft sprocket for LH chain. Fit LH chain. Align coloured chain links with timing mark on each sprocket  ,  &  . Release LH tensioner ratchet  . Turn crankshaft clockwise 120° until crankshaft keyway at 3 o’clock position  . Fit crankshaft sprocket for RH chain. Fit RH chain. Align coloured chain links with timing mark on each sprocket  ,  &  . Release RH tensioner ratchet  . Ensure timing marks aligned  ,  ,  ,  &  . Crankshaft pulley bolt MUST only be used once. Tighten crankshaft pulley bolt to 120 Nm. Slacken 360°. Tighten to 50 Nm + 90°  .